Come to follow the parade on the port at 11.30am ! At 9.45am at the cemetary : homage to Josette Brain with wreath laying, président and creator of Rampèu and honor president of the Fifres et Tambours. At 10.30am: Mass at Assomption church, hosted by both groups then dawn serenade at the municipality and dancing parade on the Port. At 11.30am : dawn serenade then parade on the port. Come and join us to celebrate the musicians patron ! 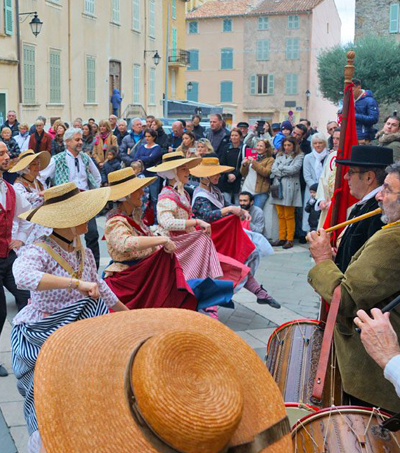 Tradition - « Sainte Cécile », traditional provencal dances of Rampéu.